Who will still fail the residence test? People who are not accepted as victims of trafficking before getting legal representation. “Today I met a woman who trafficked to the UK and forced into prostitution for 2 years. She was imprisoned for using a false passport. UK authorities didn’t accept she was trafficked. She was to be deported. THANKS TO LEGAL AID, I successfully challenged the decision in court. She was accepted as a victim of trafficking and now has refugee status. THIS CASE WOULD BE BARRED BY THE “RESIDENCE TEST”. 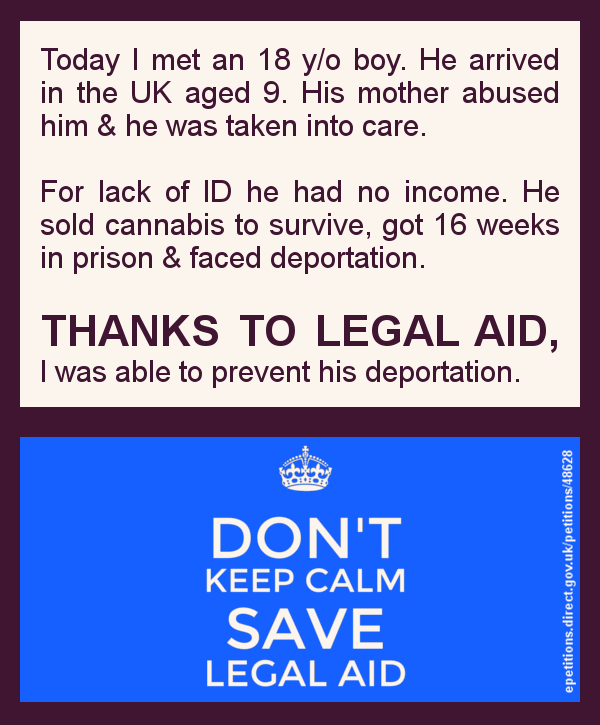 THANKS TO LEGAL AID, I prevented a vulnerable 18 year old being deported for a relatively minor offence. 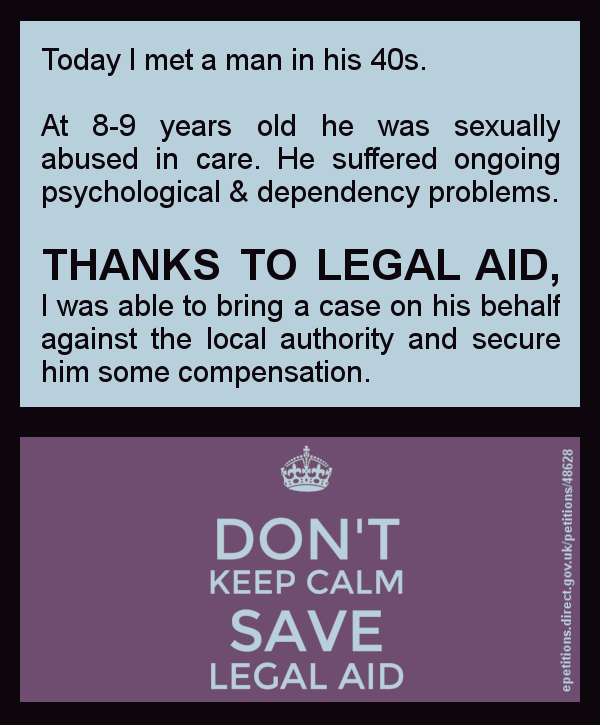 THANKS TO LEGAL AID, I was able to represent a man who, as a child, was sexually abused in care. 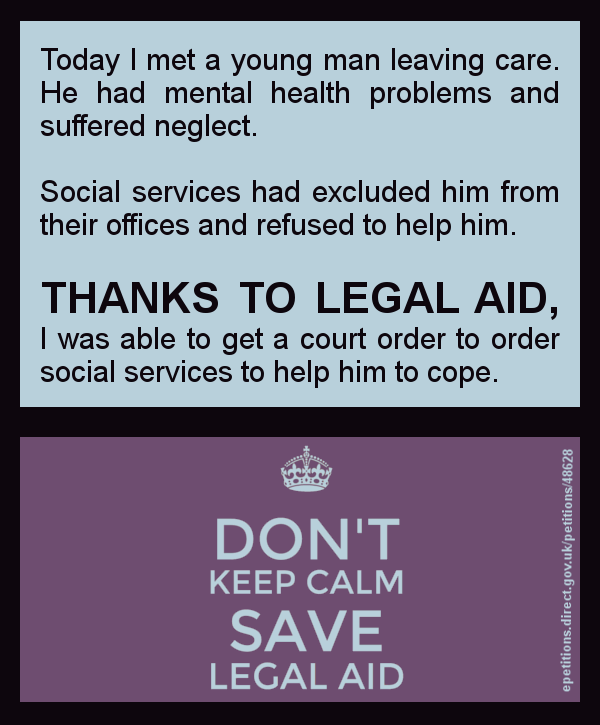 THANKS TO LEGAL AID, I was able to get a young man with mental health problems support from social services. Welcome to this blog, which is part of YLAL's campaign against cuts to legal aid. "Legal aid" is publicly funded legal advice and representation to people otherwise unable to afford it. Here you will find anonymous case studies submitted by legal aid lawyers and their clients. Take a look to find out how legal aid provides a critical lifeline to the most vulnerable people in society. Young Legal Aid Lawyers (YLAL) is a group of students, paralegals, trainee solicitors, pupil barristers and qualified junior lawyers who are committed to practising publicly funded areas of law in England and Wales.